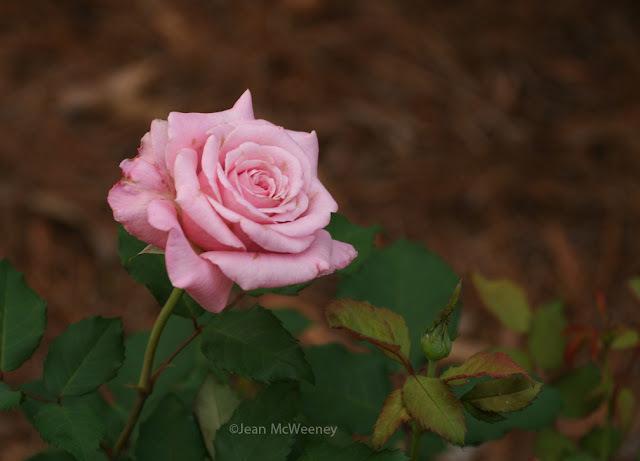 I completely missed Garden Bloggers' Bloom Day - by an entire week! Just too many things going on, including trips out of town. So instead of showing the usual bloomin' things here, I thought I'd show you some of the new-for-this-year things. First up, my very first peony. Granted, it only had two blooms but I'm righteously proud of them. You just don't see many (any?) peonies in my neck of the woods. I've been fortunate to receive many plants this spring that I actually didn't order (a perk of the job I guess). This Darcy Bussell rose came bare root and just a tad later than I would have liked. But it immediately set about growing and blooming. Lots of nice blooms for such a young plant. A tad blurry, I know. 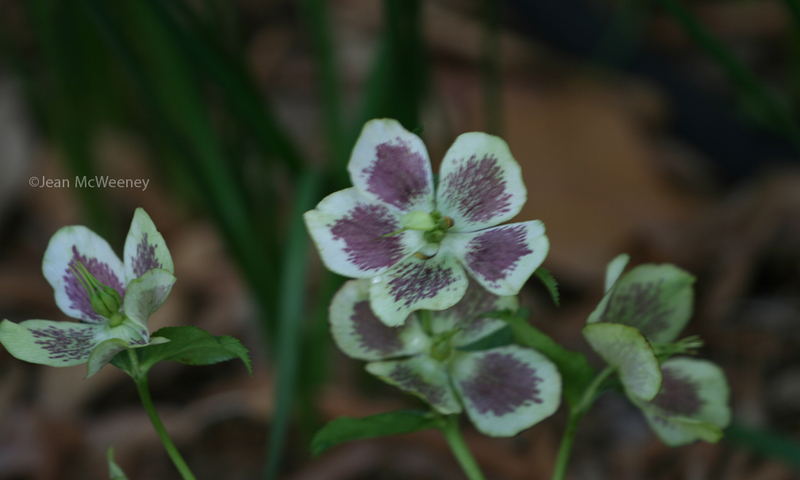 Found this hellebore at a local nursery, another first for our area (my other hellebores traveled long distances to get to my yard, including some from a blogger friend, Lynn). 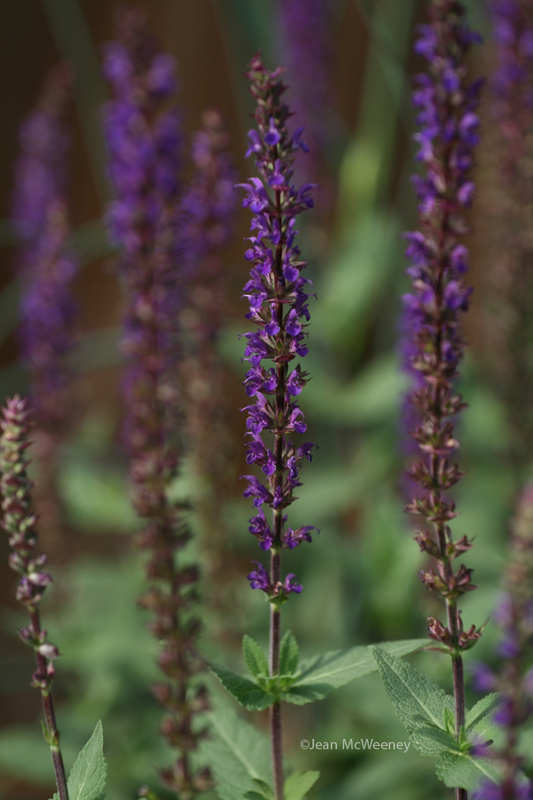 I actually had this salvia last year but it struggled a bit (I even lost one plant). It's now blooming quite nicely. This is a small salvia, and very attractive to bees. My new mini-stock tank now has plants, a small water lily from Pam, and a blue rush. The 'Fireworks' clematis in the back has already lost its blooms. That's how long it's been since I've blogged, I guess. The majority of my roses are new this year. I ordered this from Antique Rose Emporium and was pleased with the shape it was in when it arrived. This has a lovely scent and many buds and I hope it gets nice and big. This plant does not look real impressive here. And it's not even new. It's going on its third year here but in a new place. But if finally bloomed. Rather sparsely, but it did bloom. Maybe it'll be happier in its new location and bloom even more next year. 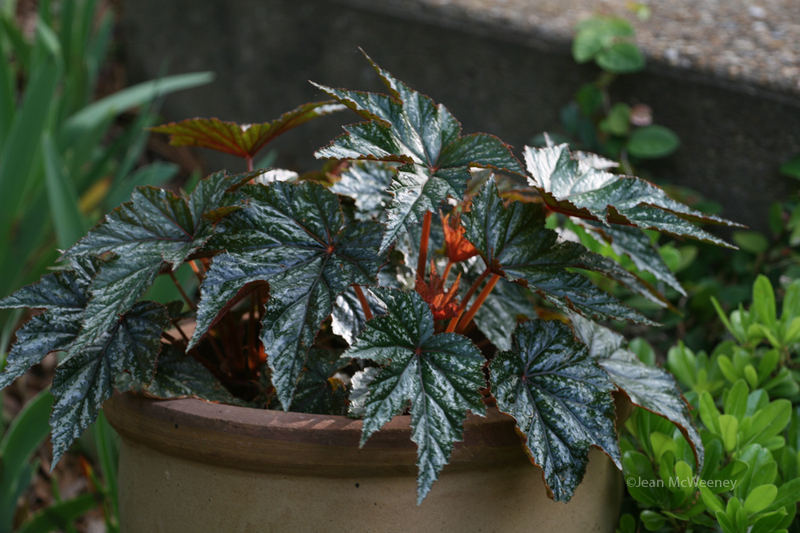 This 'Gryphon' begonia is neat looking, isn't it? I may have jammed too many in this pot (there's three), so I'll be watching it carefully. So far I really like it. 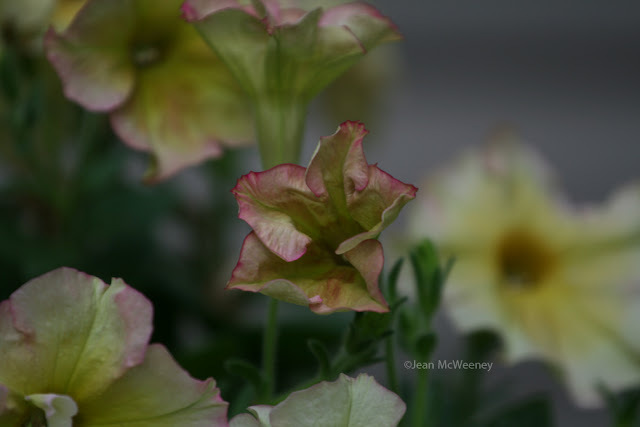 I can't even remember the last time I bought a petunia but this year I have several. I'm really liking this Pink Lemonade Suncatcher petunia. Unusual colors, and though you can't see it in this photo, the colors go well with its terra-cotta pot. 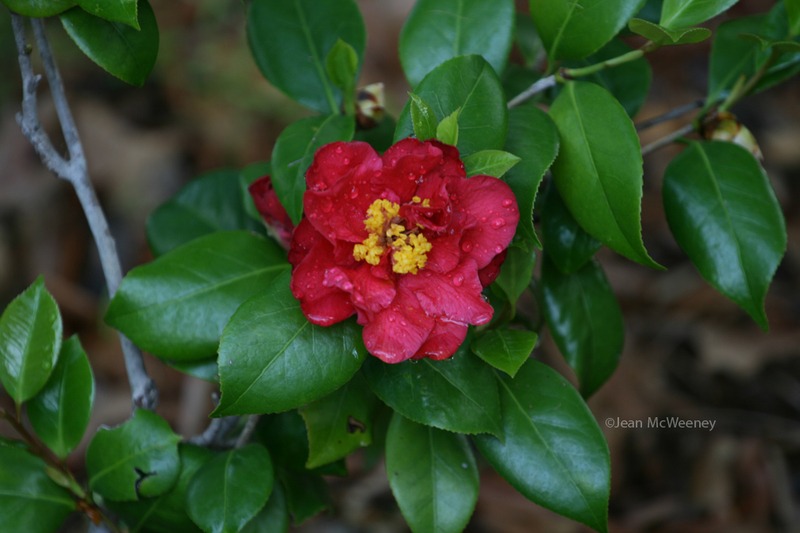 I've had this little camellia for many years now, and for the first time it's decided to bloom. Another new but old happening in my garden. This Dragon Wing begonia is still a small plant but it's putting on some big blooms. I can't wait to see how it holds up in the summer heat. This may have to move to a shadier spot then! Yes, I've had this succulent shelf before but every year it's usually got some new things going. This year some new plants include the old-fashioned jade plant (far left) and spear head (Senecio kleiniiformis), second on the left. Oh, and I have another family of chickadees in the bird house! 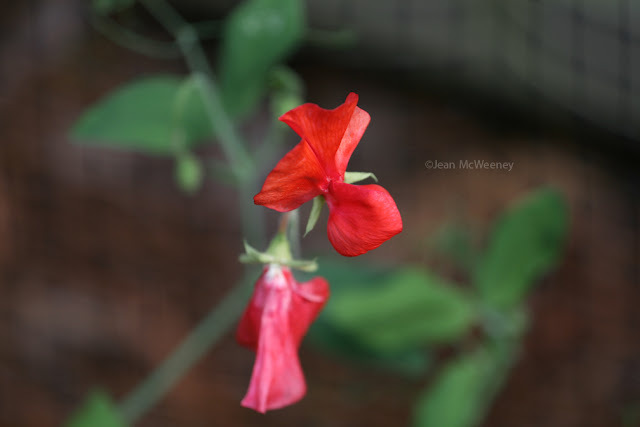 I'm about to admit defeat when it comes to sweet peas. I just can't seem to get them going well. At least I got ONE bloom this year! Here's something I'm really excited about. Not the redbud or rose, although they are wonderful, but the continuing work on my front "hardscape." Some of you have already seen the trellis the rose is on when I featured it late last year. Now I have a gate into the backyard. 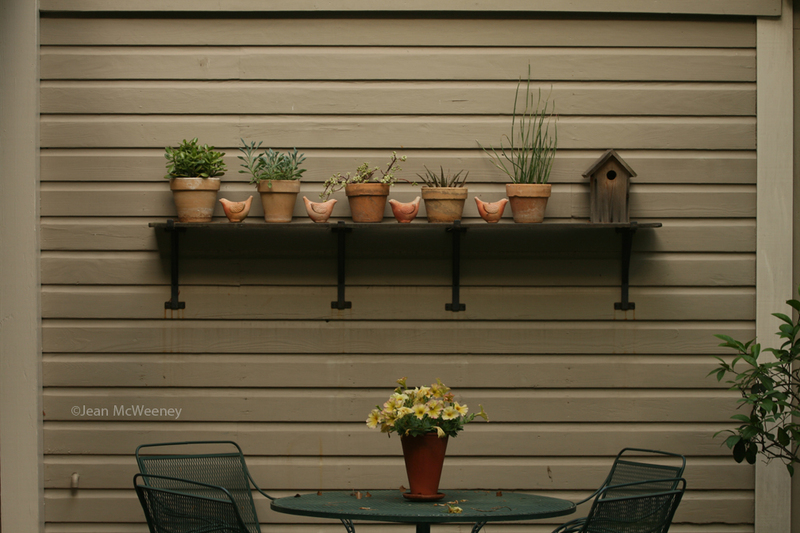 And the trellises on the left are for a utility area. The tops of it and its gate are not on yet. 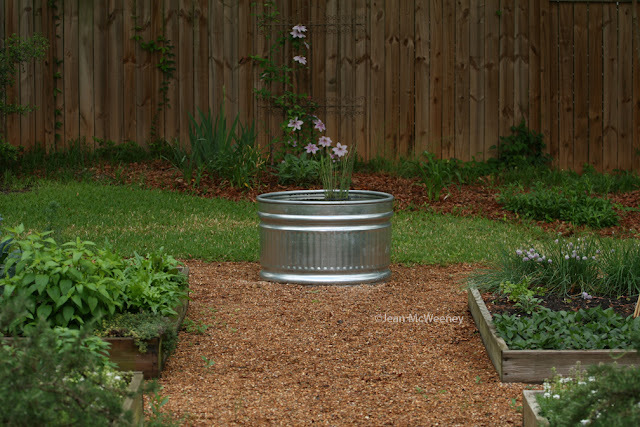 After they're put in place I'll put some gravel down inside, install a wooden compost bin, and plant some vines at the base of the trellises. Eventually the tree on the left will be removed (it's a "weed" tree). Once all is completed, I plan to do a post about it, why it was designed this way, and showcase my friend who designed it. I hope you enjoyed the tour through the new in my garden. Be glad I didn't show you every tomato and pepper I've planted! Everything is just beautiful in your garden. I have lots of peonies and can't wait until they begin showing their red shoots. Not much happening here except coltsfoot along the roadside, but I can be patient. Oh, dear, I hope your 'M. Jules Elie' isn't as floppy as mine. 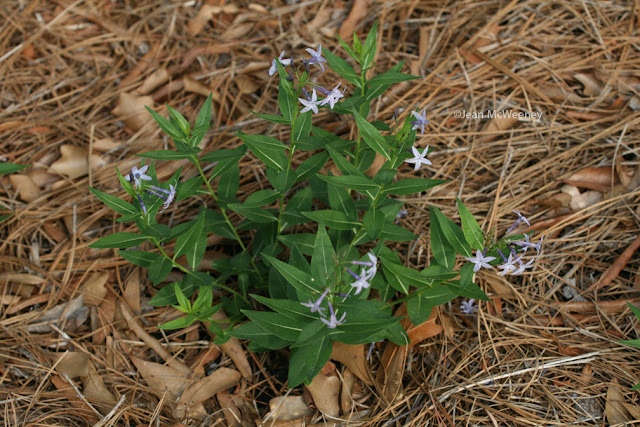 It does make a great cut flower if you take it when the buds show color and let it open in the house. I love it when something that's been hanging around for years suddenly decides to bloom for the first time & the gardener's patience is finally rewarded. 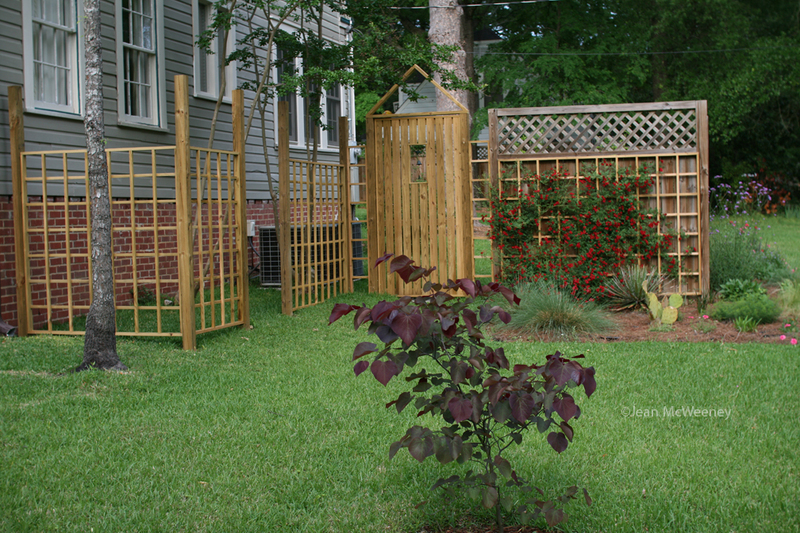 The trellising for the utility area is a great solution. It looks good already. Jean, you inspire me! I love reading your blog! Your pictures ere beautiful & I am so envious of all your blooms. We're still waitng for Spring to stop being such a tease here in Jersey. I specially love your succulent shelf & trellises!!! Lovely flowers,Jean, you're not the only one who missed Bloom Day! Lovely peony, they are a joy, aren't they? 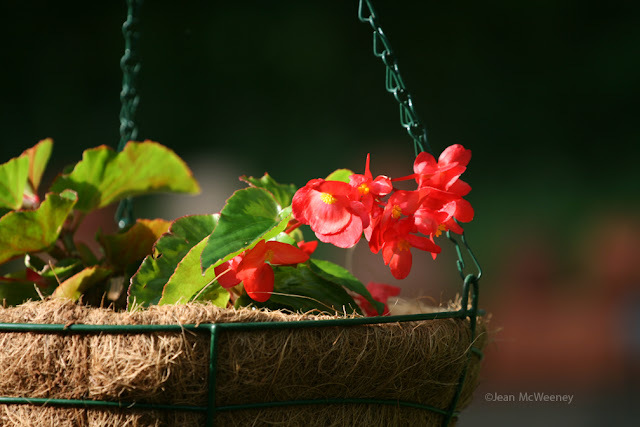 So many cool things happening in your garden, Jean - especially that Gryphon begonia... hope you have some time to watch things grow! 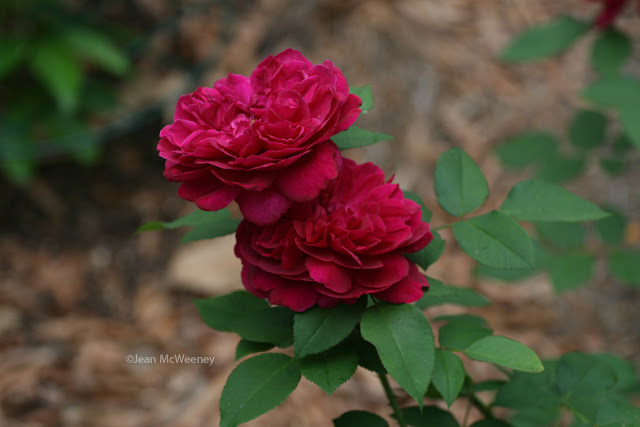 Jean -- Viewing these photos of your lovely plants and beautiful evolving garden are a little mental vacation for me. Thanks! I'm excited to see how Belinda's Dream works for you. I love your new gate and the rest of your utility area. I need some of that in my garden. I'm at that place where I want it all now now now! Patience is a virtue. Right? totally impressed you got a peony to bloom! I know exactly how you feel, this is the latest I've ever posted for bloom day too. I love, love, love the succulent shelf! You can grow peonies? NO FAIR! You can grow peonies? NO FAIR! In retaliation, I may steal the succulent shelf idea! Cindy, hee, hee! Who knew you could grow peonies in the South? Actually, I researched the heck out of it before buying one that's supposed to work here. May have to try a different one next year. Feel free to steal the succulent shelf idea! Jean, I really love your new gate and trellises! Your succulent shelf may not be new, but I don't remember seeing it before--it really is an eye-catcher, especially with the chicken figurines amongst the succulents. 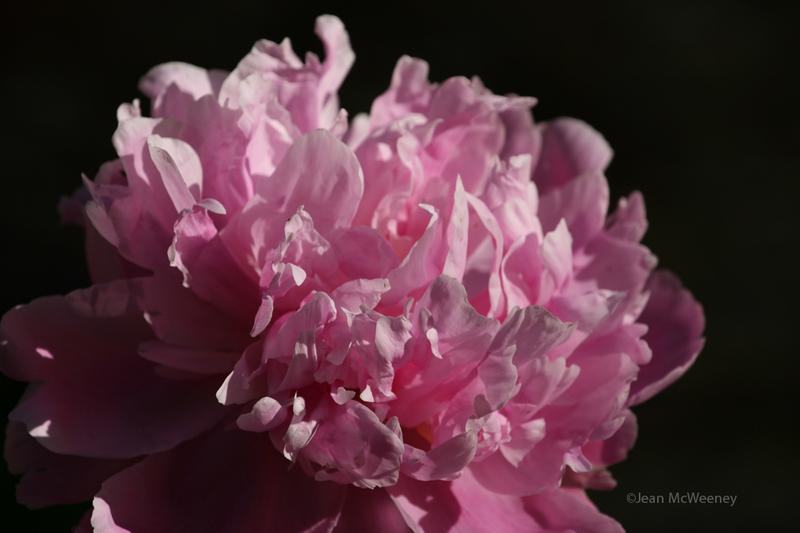 I just planted my first peony,too--I can only hope mine will have blooms as pretty as yours! Lovely garden,everything is so beautiful! I loved your tank and the clematis. Just look at that big, fluffy, pink peony. Pretty as a picture. Everything looks so perfect in your yard. Hardly anything blooming up here, but I'm not complaining. No floods, no fires and no tornado. Hope your spring has been delightful, Jean. Love the roses and the shelf is adorable. Can't wait to get my privacy fence up. It makes a beautiful backdrop for a garden. Those Amsonias are a bit slow to establish. Last year (the first year for some plants I had planted the previous fall) they all put out 4 or 5 spindly stems...that was it. I wasn't sure they would even come back. This year, they're all back and one even has flower buds on it! Not sure why that one is so much happier than the others! I love that metal pot - great touch! I can practically smell that peony. 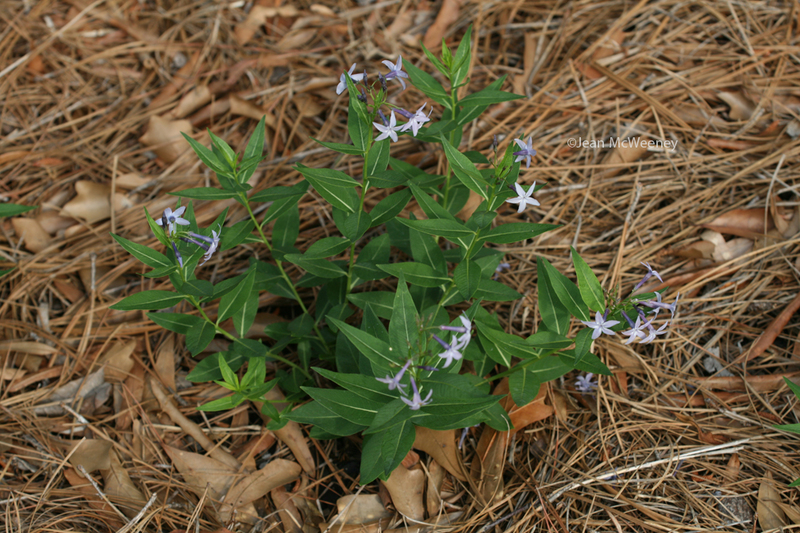 Typically you don't get many flowers the first year or two so looks like you are on schedule. Love the trellises and gate in the last shot and looking forward to more details.